“That would be fine in Malibu, but Truro is not Malibu,’’ says Nathalie Ferrier, who lives near a mansion ordered to be demolished. TRURO - The largest single-family house in this singular sliver of Cape Cod is a sleek, glassy, contemporary concoction whose 8,333 square feet, spread and stacked on top of a dune, offer a $10 million view of the shimmering bay. Construction ended only months ago, and the owner, a woman from Boca Raton, Fla., has not moved in. If the town has its way, she never will. In a recent decision that has delighted or dumbfounded residents, Truro officials have ordered the dream house demolished by mid-April. “It’s unquestionably been a very polarizing project,’’ said E. James Veara, the town attorney. The crux of the demolition order involves legal interpretations of arcane zoning law. But to some neighbors, the bigger question is the location of the house built by Donald and Andrea Kline. Officials in Truro have ordered that a 8,333-square-foot house, which has been at the center of controversy for several years, be demolished. 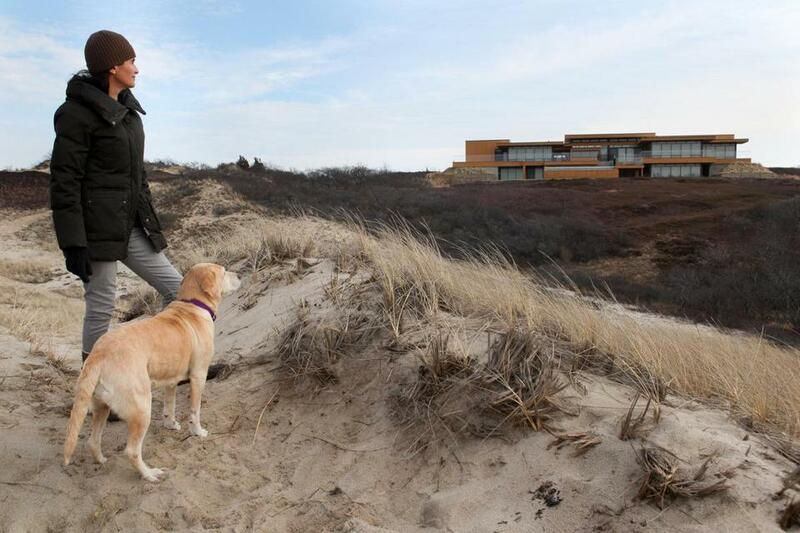 Critics call the home - bounded by sea, sand, beach plum, and broom crowberry - a blot on a stunning landscape painted often by American artist Edward Hopper, whose modest 1930s home and studio stand next door. Donald Kline died two years ago, after construction began, but the real estate businessman’s family pledges to appeal the Truro building commissioner’s Jan. 20 demolition order, according to Boston lawyer Diane Tillotson, who represents the Kline trust. The family’s appeal, Tillotson said, is likely to assert that demolition is unfair and an example of selective enforcement. The Klines received a building permit in May 2008 that approved the house as an “alteration’’ to a much smaller house elsewhere on the property, but neighbors went to court to fight the project. Despite warnings about the court challenge, Veara said, the Klines began construction anyway. In May 2011, the state Appeals Court rejected the new residence as an alteration, and the Truro Zoning Board ordered the permit revoked. “An entirely new building on a different location, which is also completely different in appearance and more than four times the size of its predecessor, cannot correctly be deemed an ‘alteration’ of the original,’’ the court ruled. In this rural community of 2,000 year-round residents, whether the house will be razed seems to be anyone’s guess. “Since it’s up, just let it go,’’ said Brett Kaplan, 21, as he worked behind the counter. “They say it doesn’t fit, but I think it’s a nice home,’’ Schmidt chimed in. In the local newspaper, Kline supporters have assailed the town’s decision while lauding the family’s contributions to local charities. Near the house, which features floor-to-ceiling glass and pools in front and back, the reaction can differ dramatically. Bernays said the house harkens from somewhere far from the weathered clapboards and gray shingles of vintage Cape Cod. For all the aesthetic angst produced by the house, the Kline family reached a settlement in 2011 with two of its neighbors, including the current owner of the old Hopper home and Alan Solomont, the US ambassador to Spain. Those neighbors withdrew their request to revoke the building permits after the Kline family agreed to set aside most of its 9-acre property as conservation land. That agreement has prompted Tillotson, the attorney for the Kline trust, to question why the town pursued the case. “We were surprised when the town decided . . . that they now needed to essentially enforce on their own the Appeals Court decision, despite the fact that no one was asking them to do that anymore,’’ Tillotson said. Veara said the town simply is following the law. “That doesn’t mean they made any deal with the town, and it doesn’t change the fact that, as a result of the court’s determination, it violates zoning,’’ Veara said. Joan Holt, a former Planning Board member, said the case’s importance is not about the house’s size or location but the integrity of zoning bylaws. “It does mar the landscape, but that’s not the reason,’’ Holt said, for her opposition. Even Bernays, who said the house would be a fine addition somewhere other than Truro, does not want it torn down.